Another day, another Samsung Galaxy S II visit in our office, folks. We have just received the AT&T version of the powerful Samsung droid today, and here come our initial impressions for you. 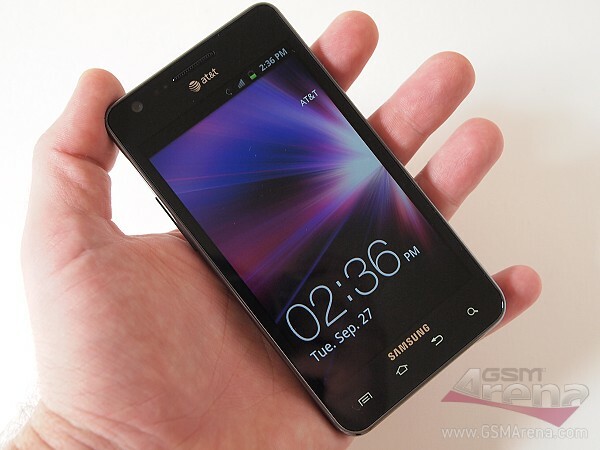 The AT&T Galaxy S II is the closest relative to the I9100 from the U.S. trio. In terms of measures and appearance, it is practically identical to the original Galaxy S II, save for the button arrangement in the front of the device – the AT&T version has received four touch sensitive ones instead of the three button configuration which the rest of the world sibling has. In terms of specs, there is absolutely no difference between the two handsets, except for the added NFC capability to the U.S. droid. The 1.2 GHz dual-core Exynos CPU is present, along with a gigabyte of RAM. There is 16GB of built-in memory, expandable through a microSD card slot. The screen is the well-know 4.3″ Super AMOLED Plus unit from the I9100, which is still the one to beat in the industry. Next to its Sprint Wireless relative – the Epic 4G Touch, the AT&T bound Galaxy S II looks slimmer, and considerably more elegant. The trade-off for this occurrence is less Super AMOLED Plus goodness at your disposal, compared to the Epic 4G Touch, as well as a smaller battery. We took a few shots of the droids side by side to give you an idea how they fare in size. You can see them below. The AT&T Galaxy S II comes with Android 2.3.4 Gingerbread, adorned by Samsung’s latest TouchWiz UI. We have a video of the droid in action for you. The Samsung Galaxy S II will hit the shelves at AT&T on October 2. We have a review in the works, so stay tuned!